We’re down to just four cities: Milwaukee, Dallas, Houston, and Tulsa. But only one can be the champion of Parking Madness, our hunt for the worst parking crater in an American downtown. Today is a very exciting day, because we’re kicking off the Final Four with two venerable parking competitors: Milwaukee and Dallas. 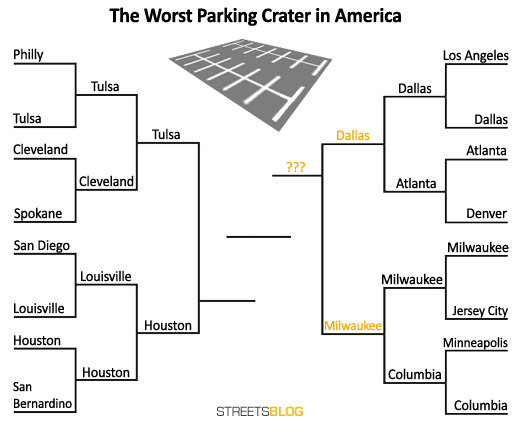 Milwaukee has been holding strong through two contests — thanks, presumably, to the sheer expanse of its parking crater. This wasteland is part of Milwaukee’s Third Ward, not far from the lakefront. “It’s acres of parking over the former bustling wholesale food warehouse district, mostly serving eight or nine weekends and 10 full days each year associated with Summerfest and Milwaukee’s various ethnic ‘-fests,’” Aaron says. Here’s a panned out view that shows this parking travesty’s position between the Third Ward and the lakefront. It’s definitely ugly, but is it championship worthy? Let’s take a look at the competition. Kunstler described this area as “a wilderness of surface parking, freeway ramps, and pointless ambiguous ‘green spaces.’” It’s certainly an impressive expanse. Let us know which one you think is the worst. Our final Final Four matchup Monday will be Tulsa versus Houston. while you’re talking Milwaukee, you can also award it a special mention for worst mammoth highway interchange that cuts off one section of the city from another. 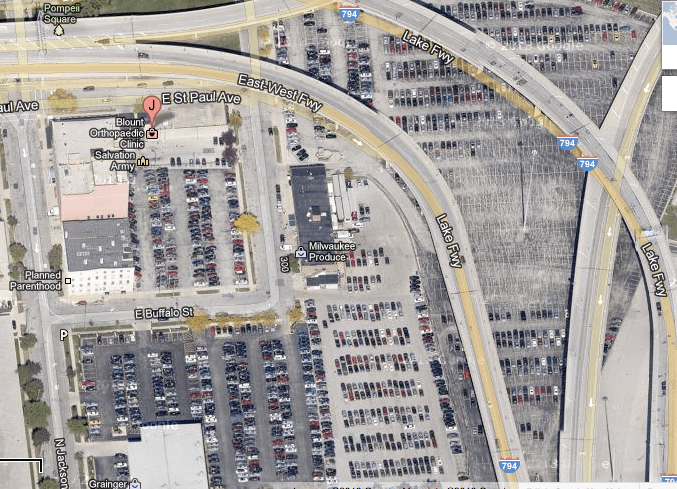 Take a look at the satellite view of I-794 and I-43. It’s a no-man’s land beneath this spaghetti nest of highway lanes overhead. 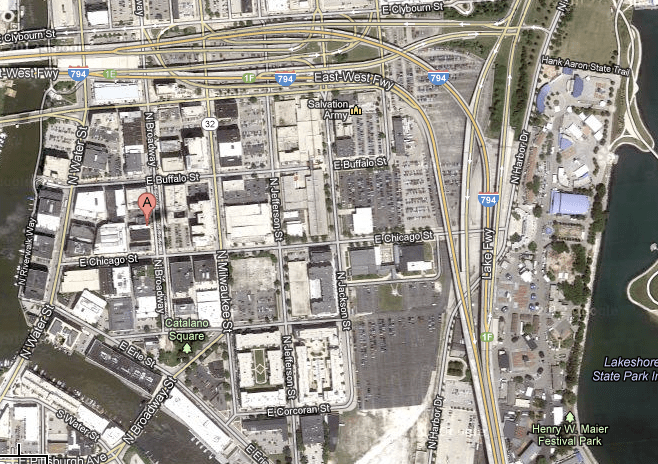 Plus, it completely isolates Milwaukee’s Amtrak and bus station from the rest of downtown. It would be so walk-able to between the Amtrak/Bus station and points of interest downtown if were not for that horrible, forbidding overpass interchange. No one walks to/from the station because of it. At this point for me, all the finalists are painfully bad. So it stops being about how bad the (ahem) urban planning is, and picks up with how much potential has been squandered. In that regard, Milwaukee has (to my understanding of history and place) a greater legacy as a city, and therefore I regret it’s decline more. Just my two cents. What about downtown Albany, NY? Specifically the numerous empty blocks around its Greyhound bus terminal? Milwaukee is determined to win this. Our leaders in City Hall continue to allow our historic built environment which offers so much economic and aesthetic potential to be plowed down. The Schlitz Brewhouse which made Milwaukee famous is currently being demolished for parking. 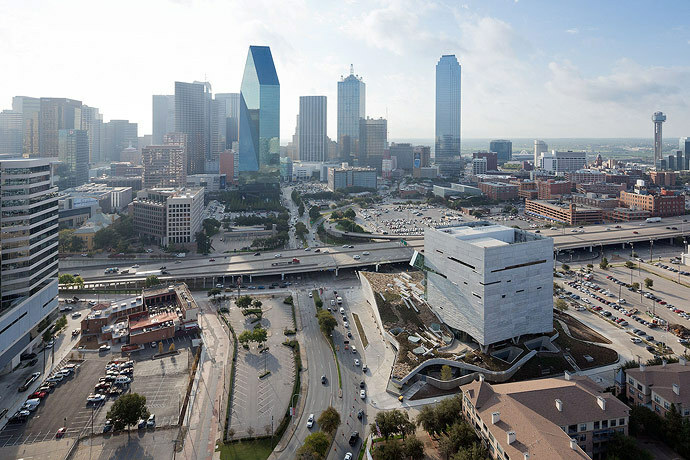 I don’t think you can beat Texas on mammoth highway interchanges cutting apart cities, The ring(noose) around around Dallas’s core is a great example, it has three interchanges just as large and another three nearly as large. Is there going to be a special award of shame for the “winning” city when this is over? Because this is exciting. Somebody should get a Golden Crater, or Golden Dunce or something. 1st place – Plutonium Crater – They nuked their city. P.S. The nice thing about plutonium is that the shorthand (Papa Uniform) stinks. Milwaukee’s will only be around for a few more years though. Here’s are new plans to revamp this area by 2016. Milwaukee is planning to reconfigure I-794 ramps and connect Lincoln Memorial Drive to the Third Ward. There will be extensive rehabilitation of the pedestrian network between downtown, the Third Ward and the parks and museums along the lakefront. Two skyscrapers are proposed (44 story and 30-35 story) near this location. It’s only a matter of time before these parking lots are developed. However, Milwaukee is a slow acting city with a weak real estate market, and it may be 10 years before these lots are gone. But on the rare occasions Milwaukee goes big, they do it right. I look forward to the future!